Hello from the other side of my first Fashion Week! 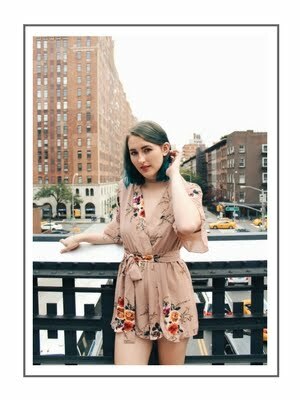 I've been dreaming of this experience since I was little, and I can't believe I made it happen within two months of moving to NYC. In all honesty, it was just as magical as I always hoped it would be. Of course, there were a lot of ways in which it was different from what I expected... But more on that later. When Kelsey of Blondes & Bagels had her flight delayed due to the low-key blizzard that swept through NY last Thursday, there was suddenly an extra ticket to Michael Costello up for grabs. Given the last-minute notice, I attended my first-ever Fashion Week show in my Hunter rain boots and my grandma's hand-me-down rain coat. Given the weather outside, I wasn't the only one all bundled up with no real outfit to show. 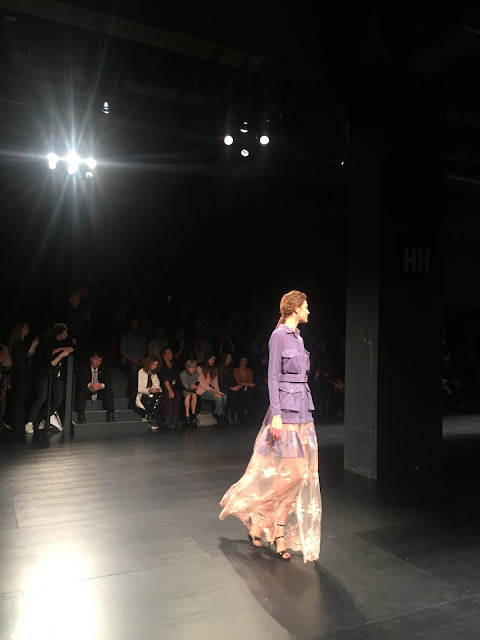 The show was absolutely magical– it was all flowing gowns with intricate details, which is kind of my desired aesthetic. 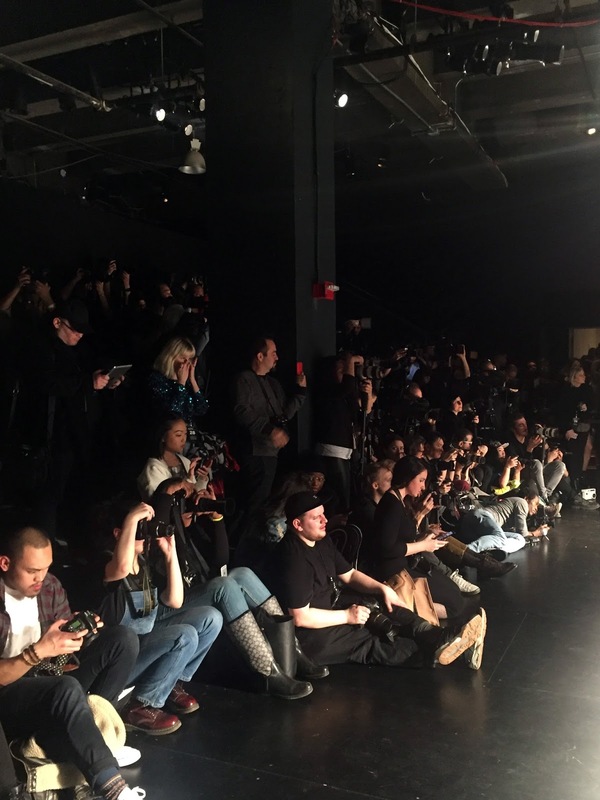 The front row hosted some pretty impressive people: I saw Shaun Ross, Cardi B, and a literal Care Bear (see it?). Tomi and I hit up this rad event during our lunch break to hear Gergana Ivanova of Fashion is my Forte and Veronica Webb of Webb On the Fly talk about their blogging careers and Veronica's experience as a model. Tomi and I got these tickets from Brittiny of Fashion of Philly. We didn't take any pictures worth posting– the lighting was really terrible, and the venue was too small to allow for us to be able to take properly-framed pictures. Still, there were some pieces I really enjoyed, and we got free food. Sadly, no photos here, either. Turns out clubs don't make a very good place for snapping pics. I was proud of myself for going to a club in the first place (the last time I went was when I lived in Spain– don't tell my host family), and Tomi and I had a lot of fun dancing with a bunch of very fashionable strangers. This was my first ~solo~ show. Brittiny of Fashion of Philly gave me a standing ticket. A standing ticket, I came to learn, is what they give people they want to attend the show, but who are not quite important enough to be guaranteed a seat. We stood in line and waited until they were sure everyone showed up who was going to show up, then we were allowed to fill in whatever seats weren't taken or stand near the press. I ended up standing, but actually had a better view of the show than I'd had from a seat in the same venue at Michael Costello. Behind-the-scenes, aka "how many damn cameras do we need to document one show?" This was such a rad experience– Olivia of a drop in the ocean and I were given VIP passes, which put us in the front row (across from Miss Maryland and Miss Rhode Island, no less). I wore my OTHER grandma's hand-me-down coat. I loved being able to rep the amazing women in my family who helped me get to this point in my life. This event featured three designers: Temraza (ft. Zagh), House of Byfield, and Willfredo Gerardo, with accessories by Urban Southern. My favorite collection of the bunch was Willfredo Gerardo, who had a strong collection of flowy and intricate gowns. So, that's a wrap on my first NYFW! I hope to see everyone again in September!